There are so many reasons to join the National Performing Arts School and send your Children and Teenagers to Npas for the Dance, Drama and Singing Classes. The National Performing Arts School began life at The Factory 24 years ago, the school was set up as a place where you could get all of your classes in one place. Instead of having to go to a Dance School, or a Drama School or a Ballet School you could now take all of your classes in one place, under one roof. With over 20 teachers on the staff, the school could provide hundreds of young people and children with the best and most professional classes in the performing arts. This is still the case at NPAS as we move forward towards our 25th anniversary providing exciting and ground breaking classes. This makes NPAS Ireland’s oldest Performing Arts School – there are Dance schools and Drama schools which have been around longer, but none which covers all your classes in one place. All of our staff are professional, fully insured and qualified teachers. Many schools are run by staff who may have little experience in teaching young people and children. All of our teachers have a relevant qualification for their area of expertise. Many are graduates of Trinity College, The Lir Academy and The Royal Academy of Dancing. Still others are qualified through The Irish Board of Speech and Drama and DIT. The Factory will have some of the best professional Studios and spaces in Ireland. The Factory, our home for 24 years, is now in the process of being upgraded. During this upgrade we are lucky enough to get to use the studios at The Lir Academy and the new Hall at in Sandymount. We try at all times to provide suitable spaces with sprung floors and mirrored studios. The new Factory will have 8 of the finest multi purpose studios in the country and should be ready by Christmas 2018. Productions in professional theatres. One of the best Reasons to join the National Performing Arts School is that every 2 years we have a full school show where all classes and students get to perform in a professional theatre, usually The Olympia Theatre in Dublin. 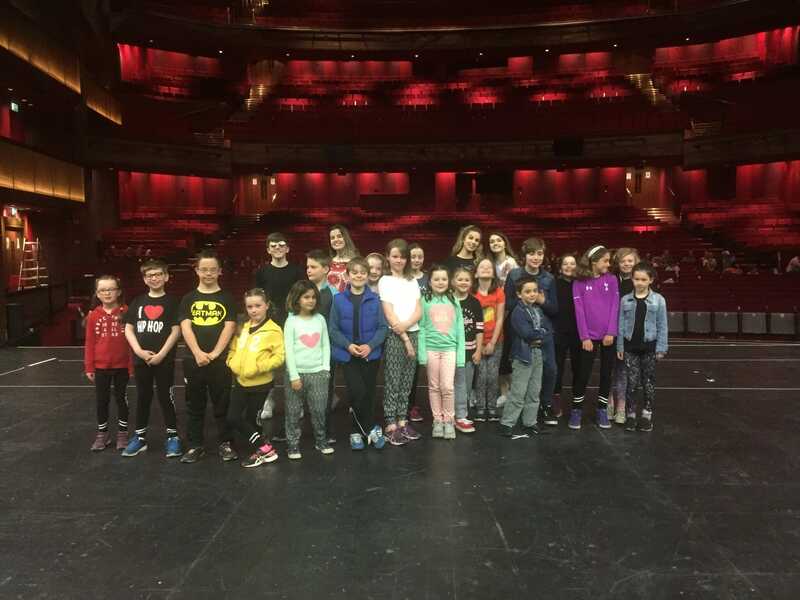 This year we even had rehearsals with all classes at The Bord Gais Energy Theatre at Grand Canal. We en-devour to provide our students with an amazing experience in venues which they would visit to see many professional shows. NPAS loves what we do. NPAS is about our students. The Directors are aware everyday that NPAS is the school children and young people run in to an hate to leave! We know that our purpose is to instill confidence and a love of the Dance, Singing, Drama, Musical Theatre, Film and Television Production in all our Students. NPAS makes everyone feel GOOD! Our motto is ‘Be Who You Want to Be’. Everyone who attends out school is treated as the unique individual they are and we do our absolute best to nurture their abilities and personality by using Dance, Drama and Singing as the means to do so. We hope these alone are reasons to join NPAS and to send your child to NPAS and we look forward to welcoming you here this year and into the future.